A move out is sometimes required as another unfortunate step towards the completion of your restoration process. It involves moving your contents to a remote location for more specialized cleaning and repair when your home is severely damaged and cannot accommodate a safe and professional cleanup. 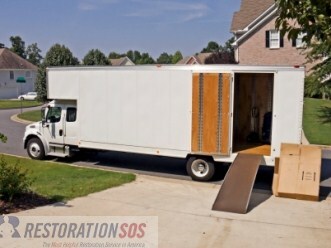 To perform this task, your restoration company will often utilize moving companies. Some items cannot be restored onsite because they require special restoration requirements such as equipment, a sterilized environment, or special care and protection. For example, restoring papers and documents sometimes requires the use of deep freeze technologies that are available only at the restorer's location. If your home is determined to be not safe to stay in, it may also be not safe for your personal belongings. For example, if the structure suffered extensive damage, it is recommended to move your items to a safer location to protect them during reconstruction of the home. A successful restoration process often requires low-humidity environmental conditions. This cannot always be achieved in your home. For example, one technique, used by restoration professionals to slow down the deterioration of materials, is to keep content in low temperatures. This can be achieved using specific air conditions. If the electrical system in your home is damaged and air conditioning cannot be turned on, your restoration company will recommend a move out. Moving your items out of your home makes your home a better and more secure construction site. If the structure was damaged in a way that requires remodeling and reconstruction, the process can be completed much faster if your items are out of the way. In some cases, a restoration professional will recommend a move out if the structure and/or the neighborhood must be evacuated. In this case, the move out is recommended for security reasons, to prevent additional loss, burglary, and looting by moving your items to an offsite, secure warehouse. Water Damage Restoration: How Much Does it Cost and What Affects the Pricing?